The saola is the largest terrestrial mammal never seen alive in the wild by a biologist. This is not a Bigfoot story. The saola undeniably exists. It roams only in the Annamite Mountains of Laos and Vietnam. Biologists know very little about the saola. But one thing is clear: They are in big trouble. A poaching crisis in the Annamite Mountains is hammering wildlife, and a rare species like saola stands little chance in a landscape literally covered in snares. But how do conservationists protect a species that scientists have not even seen in its native habitat? The challenge is monumental. It is, essentially, trying to save a unicorn. Bill Robichaud, is one of the world’s experts on saola. At a lecture he gave at Zoo Boise – a funder of saola conservation – he began by attesting that being a saola expert should come with a bit of qualification. But what is known is astonishing enough. In 1992, a joint biological expedition by the Vietnam Ministry of Forestry and the World Wide Fund for Nature conducted a survey in the Annamite Mountains, a global biodiversity hotspot. When a biologist visited a local village to pick up vegetables, he noticed horns hanging in a hunter’s house of an animal he didn’t recognize. It proved not only to be a new species but a new genus. While it looks superficially like an antelope or perhaps a wild ox, there really are no comparisons. “This is not like a new species of deer or new species of wild goat. The saola was something entirely new,” says Robichaud, who works for the organization Global Wildlife Conservation and now heads the IUCN’s Saola Working Group. The Annamite Mountains proved to be a biological treasure trove, with other major wildlife discoveries including the bare-faced bulbul, large-antlered muntjac and Annamite striped rabbit. “The saola is the most spectacular chapter of what is a remarkable story,” says Robichaud. And the saola chapter has continued. They have since been documented on camera traps. One has been seen alive by outside biologists, but it was captured by a hunter and confined to a general’s menagerie. Robichaud, who has now made significant expeditions to the Annamites, was able to spend time with that animal, but unfortunately it died after only 18 days in captivity. 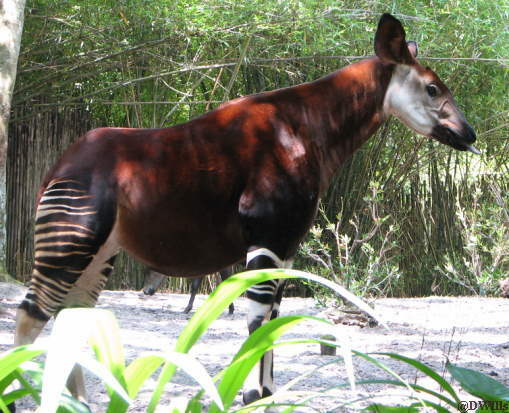 Most of the information on saola has been gathered from information from local villagers and hunters. Even locals only rarely see them, and then typically when the animal is bayed by dogs. It is a solitary forest browser, and does not bother village gardens. Biologists don’t know how common saola once were, but as with many wildlife species in Southeast Asia, its populations likely suffered greatly during the Vietnam War. During the conflict, Laos became the most bombed country per capita in human history; more bombs rained down on it than on all of Europe during World War II. 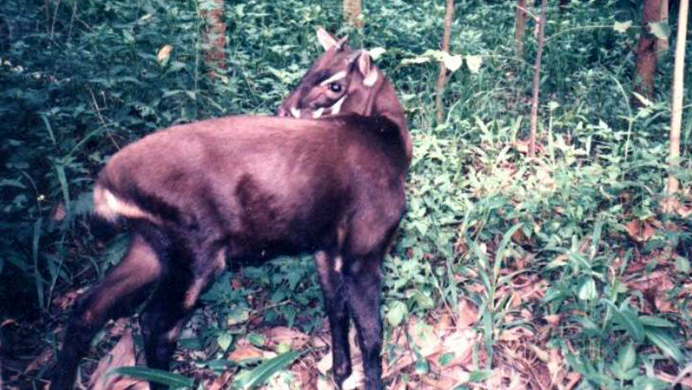 This, coupled with defoliation by Agent Orange, likely directly killed saola and fragmented its habitat. Where the distribution of saola is most patchy correlates to areas with the heaviest bombing. Today, the saola faces a seemingly low-tech threat: snares. A mind boggling number of snares. Hundreds of thousands of wire traps strung across the Annamite Mountains. A tiger can fetch $10,000 on the market, a golden coin turtle upwards of $20,000. But the saola? Zero. Since they never existed in China or outside the Annamites, they play no role in traditional medicine. Unlike many wildlife conservation stories, this is not a habitat issue. There is still plenty of forest in Laos. While poaching is a difficult problem to tackle, villagers have been huge allies. With the leadership of local people and support from zoos and other organizations, a massive snare collection effort is underway. More than 130,000 snares have been collected and destroyed at five key sites since 2011. “When you collect that many snares, you’re helping a lot of other wildlife, too,” he says. Robichaud visited Zoo Boise to meet with Zoo Teens, a group of young people who volunteer at the zoo and raise money for conservation programs. Their focus has been on funding snare removal in the Annamites. (Full disclosure: my wife works for Zoo Boise). How large are the saola? very nice story and great job. Ya….there are a number of species in the worldwide which is not yet discovered while threatened, even some of them extinct before they discovered. That is really wonderful – and congratulations to the youth at Zoo Boise for undertaking to raise funds for this animal. Good wishes for your continued success in collecting the snares and hopefully saving a rare species. This article refers to “the Chinese medicinal trade and high-end bushmeat restaurants” and “traditional medicine”. I think it’s time to rethink the impact such terminology has on the audience. Both phrases implicitly sanction the practice that the surrounding text appears to condemn. Medicine is good, it makes sick people well, or enhances an individual’s general wellbeing. “High-end” similarly refers to something special, the sort of good or service that would be highly valued/desirable. In both cases the terminology confuses and indeed white washes the truth. I would suggest the adoption of the simple phrase “for human consumption”, possibly with the modifier “principally in , , … and “. Of course this example changes the quoted words of Dr. Robichaud – I use it only as an example. Please, let’s do away with any implication that killing these creatures serves any human necessity. Drinking rhino horn tea or whatever never cured anybody – not even of impotence. My very best regards, and thanks for a great article! The picture I see does not show that this is as large as the giant eland or the elephant. Sad that this unknown mammal is highly threatened. How large is the area where the saola may be found?Larger or smaller than Texas? A very insightful article thank you! How is it called largest terrestrial mammal when nobody has seen it ? Indian Gaur is certainly bigger than Saola. We can send the measurements for that matter. Would greatly appreciate your feedback on this. Hi Jayant, It is the largest terrestrial mammal that no scientist has seen in the wild — not the largest terrestrial mammal of all. Thank you for your interest! Thank you very much for this essay on Saolas. Had never heard of them. Keep up the good work! You call them large, but their actual size is never mentioned. How “large” are they?